I have to admit – I almost never shop on Gilt. I used to be an avid Gilt Group shopper for at least the first few years of its launch, but somewhere along the way I stopped paying attention. Last month however, I opened one of their emails to find a promo for their Tibi sale. If there’s one thing I can’t avoid, it’s Tibi. On sale. Naturally, I spent a few moments grazing the sale page, not finding much, but I happened upon this pretty purple sweater. I’d actually added this exact sweater to my fall wish list last year, but thought it had sold out everywhere! By some happy accident, my size was available on Gilt so I took the plunge. Most of my fall/winter wardrobe is made up of black and gray, so it was an easy choice to add this colorful sweater to my shopping cart. 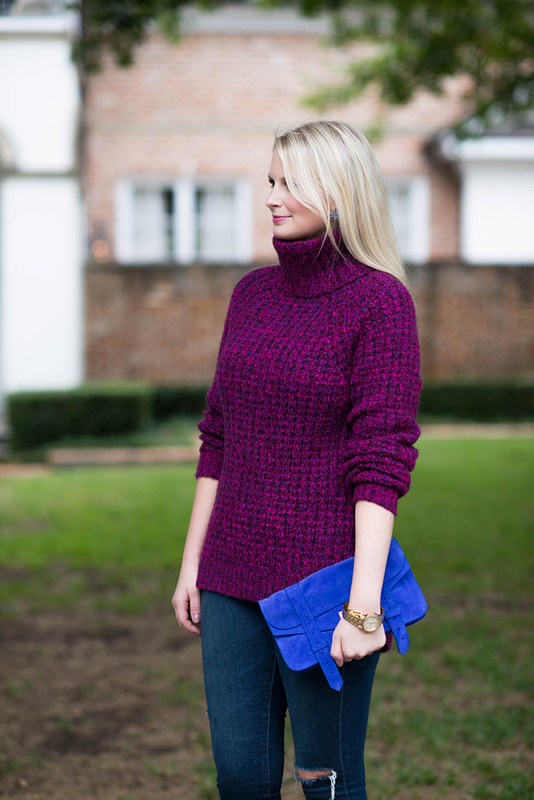 I love the subtle weaves of pink and blue among the bright purple – it makes the sweater surprisingly wearable and versatile, even with my most vivid accessories! Unfortunately, this particular sweater is now sold out, but I wanted to share a few other amazing sweaters I’ve found on Shopbop since the Friends & Family Sale is still in full swing! As far as bright and colorful options go, I’m crushing on this vivid red Helmut Lang number, this fuchsia DVF knit and this dotted cerulian blue Tibi sweater. Or if bubblegum pink is more your speed, check out this sweater by DEMYLEE. If you’re into the poncho style (like we know I am), you’ll love this striped 360 Cashmere poncho, this marled grey Joie pullover, or this leather-paneled Haute Hippie piece. If feminine details are up your alley, you’ll obsess over this peplum sweater from 10 Crosby Derek Lam, this lace-trim-hemmed pullover from JOA (under $100! ), or this pretty lace-adorned Clu sweater. My favorites? This Nili Lotan fuzzy knit, this animal print Equipment sweater and this L’Agence fur pullover. Click here to shop all chic sweaters at Shopbop and enter code FAMILY25 at checkout to save 25% off your purchase! Nice sweater. I like it with the blue. Love this color combo, it’s so vibrant. Lovely outfit. I really like the colors! 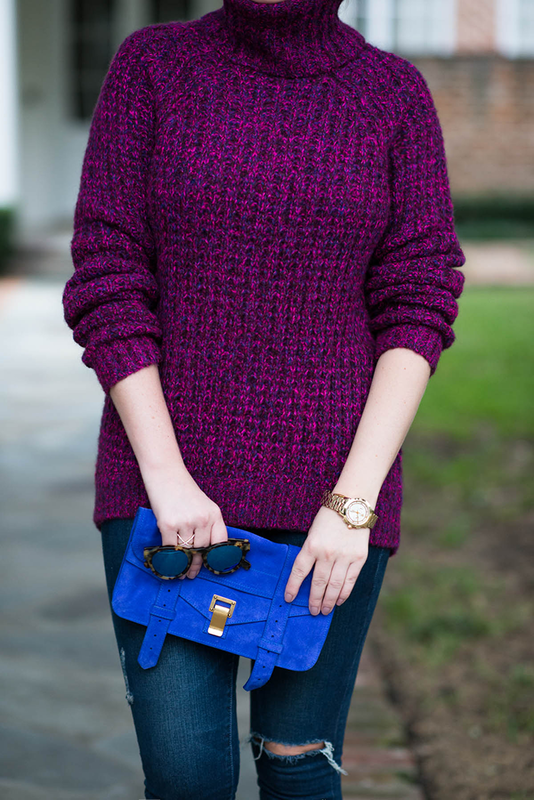 Love the pops of color here and that sweater is gorgeous! This bold color is so pretty on you and I love the high neckline – great find! This sweater is absolutely stunning! Plus it was on sale, so what is better?! I love those earrings and dainty shoes! Your clutch game is on point! I loved that sweater last year so I was so excited to get that email Gilt sent out, but it had already sold out on there once I got to it! …every time I hear the words “Cerulean Blue Sweater”, I think of The Devil Wears Prada! The jewel tones are so pretty on you! I love the sweater and the earrings go with it perfectly! Such a pretty sweater — a little bright, boldness is needed in my winter wardrobe too! You look so cute and cozy! I always love the chunky sweaters this time of year! They are perfect for keeping cozy on the cool fall night. Love how you brought out the blue in the sweater! I love this knit! The color is beautiful for fall! 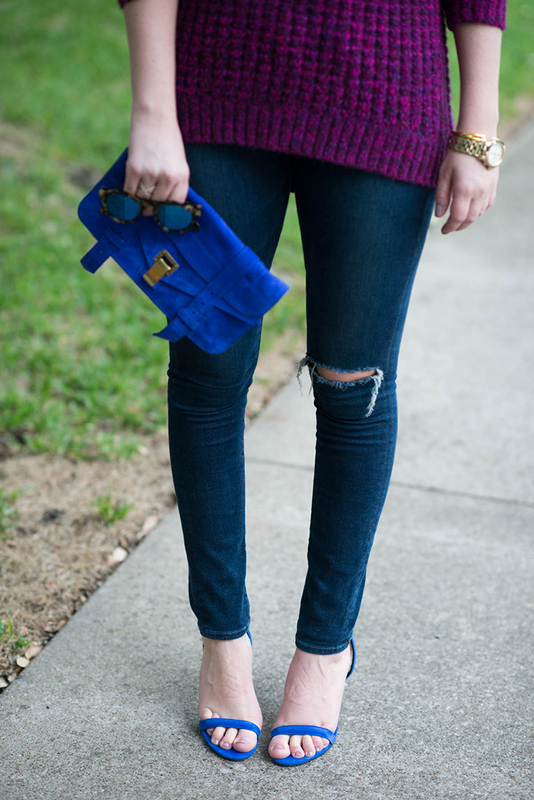 Such a gorgeous sweater and i love the pop of cobalt! This color combo is so gorgeous. I love you in color! Cannot get enough of your Alexander Wang shoes…that color is just amazing! That color looks great on you! Love it with the blue accents as well. I loved this look on insta! This color is amazing on your. Totally flatters your coloring. I love that you added the blue. SO pretty! I’ve never used Gilt before, but I love RueLaLa. I guess I need to check it out! Thanks, Merritt! I LOVE these bold colors paired together! I get in a bad habit of buying black and white sweaters only – not anymore! I love the knit and the fun mix of colors. awesome look!